Week 51 - Happy New Year - 2013! Welcome to another Polkadoodles challenge!! Before we move onto this weeks challenge, I need to announce the winner from Week 49 which was 'Paper Piecing and Newspaper'. The lucky winner of the Picknix vol 1 and vol 2 cd's is Janice! Congratulations!! Please email Nikky with your postal details. Please remember to add the verification code and the challenge week in the subject field on your email - you must use the code PD1W5149 to claim your prize otherwise we cannot release it. Our second place entry is: Debbie Johns - please email Nikky with your postal details as you have won a copy of Picknix 1 - you must use the code PD2W5149 to claim your prize otherwise we cannot release it. And third placed entry is LOU!!!! And your code for your copy of Picknix Vol 1 is PD3W5149. Congratulations to you all! Please grab your blinkies from the sidebar. We are flexible on the theme - so you can use Happy New Year OR add the numbers 2013 (eg 3 of something or the actual numbers). Just have a look below at the Design Team's inspiration on our interpretations of the theme! As this is our last challenge of the year the top three placed entries will all get a prize! The first placed winner will receive a copy of Picknix Vol 1 cd, second place will receive a copy of Back To Nature cd and the third placed entry will receive a copy of Sundae of Seasons cd! Good luck with the challenge - deadline for entries is Sunday 6 January at 12noon GMT. Ruth: I've gone with a firm favourite of mine from the Paper Boutique Vol 3 cd - the pink cupcake!! I've printed it off as A5 size, cut out all the elements and then layered up with foam pads. 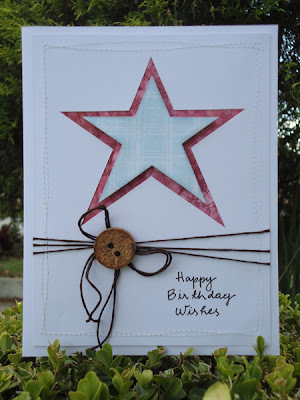 I've added die cut stars from pearlescent brown card, some ribbon I found in my stash. The 30 are die cuts from sparkly card and I've added wire so that they boing about. The star I've glittered around the edge (and on the cupcake too) and added a dotted line of liquid pearls around the inner. Shell: For my card this week I have used a twist on the challenge and I have used the 2013 part of the challenge, 1 image, 2 papers and the number 3. The card is for my Nephew's 3rd Birthday card in February. 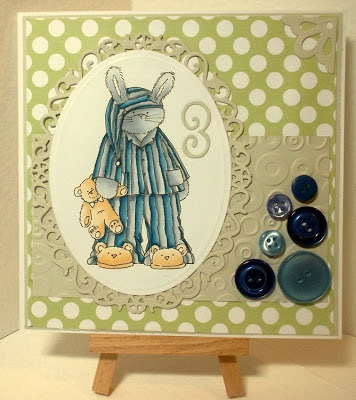 I have used the cute little bunny from the brand new Cherry Blossom CD and have coloured him with my copics, I then simply added a few buttons form my stash to complete the card. JAN: I have a really clean and simple card this week - it took about 15 minutes to make which is great as time is so precious at this time of year. 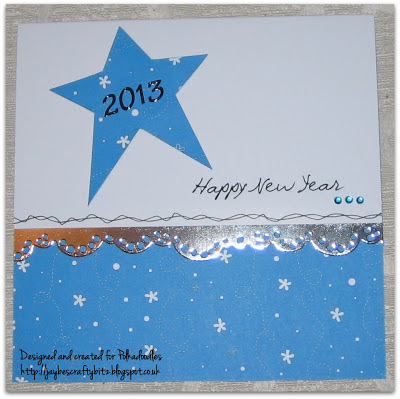 I used paper from the 'Pen & Paper Circle 3' CD and the star template can be found on the 'Sundae of Seasons' CD. A little mirri card die cut border and a 'Happy New Year' greeting printed on my computer to finish. Happy New Year everyone! 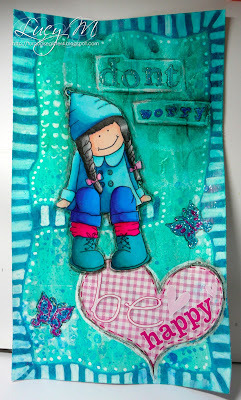 Lucy ~ For this theme I decided to do a journal page using Polkadoodle papers, image and stamps. The heart sentiment is so cute and I wanted to focus on the 'Happy' part of the theme. I tore bits of PD dotty paper and glued them to the page after painting it. Then used ink sprays over the top. I coloured the image with Pro Markers. The stamps are from the Flutterfly fairies sets. 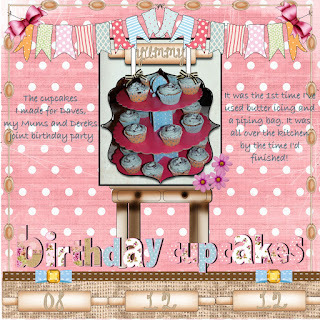 Anjie For this weeks challenge I've done a digital scrapbook page. 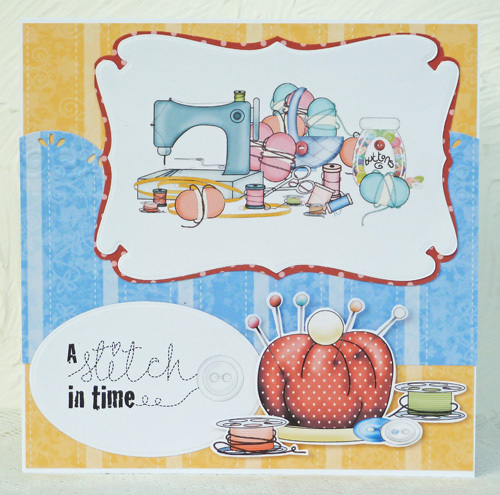 All the elements are from the fabulous Picknix Collection 2 CD from Studio 12. I've put it all together in a craft program. I've added shadows to some of the elements to make it look more 3D. To follow the challenge I've used 1 photo, 2 bows and 3 rolling pins. Clare - For my card I have incorporated Christmas and New Year using images and sentiment from the Here Comes Christmas CD and Studio 12 Picknix 2 Gingerbread Twist CD. 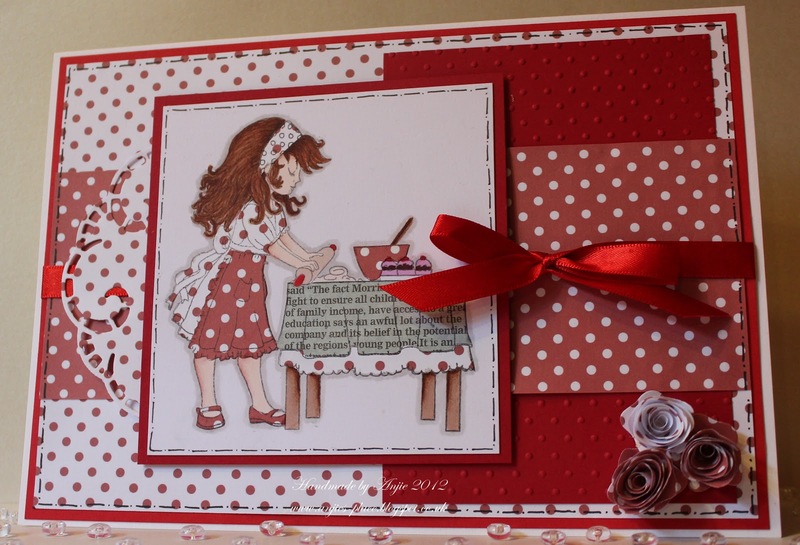 The gorgeous red gingham paper is from the new Cherryblossom Lane CD which was launched last week. 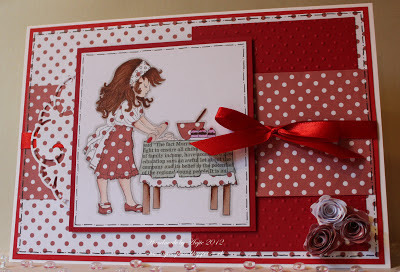 I have added some Berry Red Doodle Dewdrops and Stickles Glitter Glue to finish off my card. 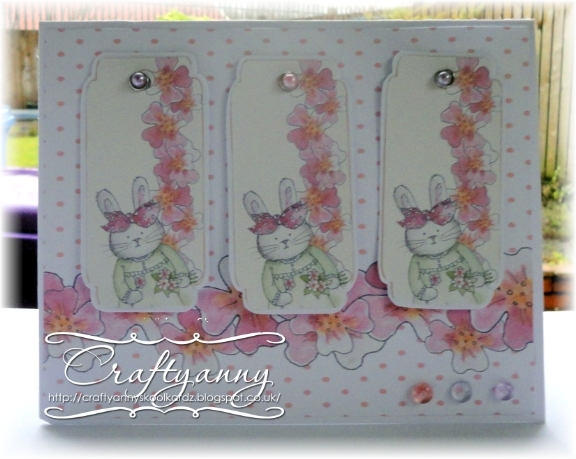 Anne - I've gone with three of something using the newest release from Nikky, Cherry Blossom Lane. This was super quick to do. I added the border to the paper in my graphics programe before printing it out. 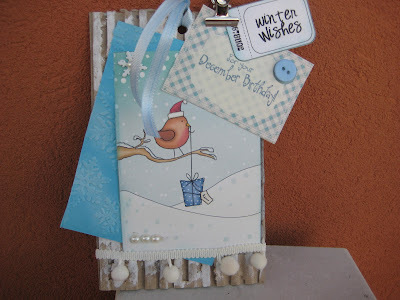 Then printed the tree tags, mounted them and attached to the card using some brads. Following on with the three of something I added three little dew drops to the bottom corner. Good luck with the challenge and don't forget our rules! Deadline for entries is 6 January 2013 at 12noon GMT. 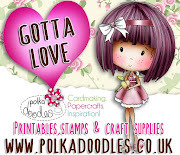 Good morning folks, it's Friday again and here at Polka Doodles today is a very special day as our Nikky is launching her brand new and totally gorgeous CD called Cherry Blossom Lane on Create and Craft TV. The shows go out at 10am and 4pm and those of you outside the UK can watch the shows online. You definitely don't want to miss this as Nikky has outdone herself to create the most adorably cute characters ever and the papers and embellishments are to die for and will have you longing for Spring as they're so very pretty. We have some fantastic prizes for you this week too. 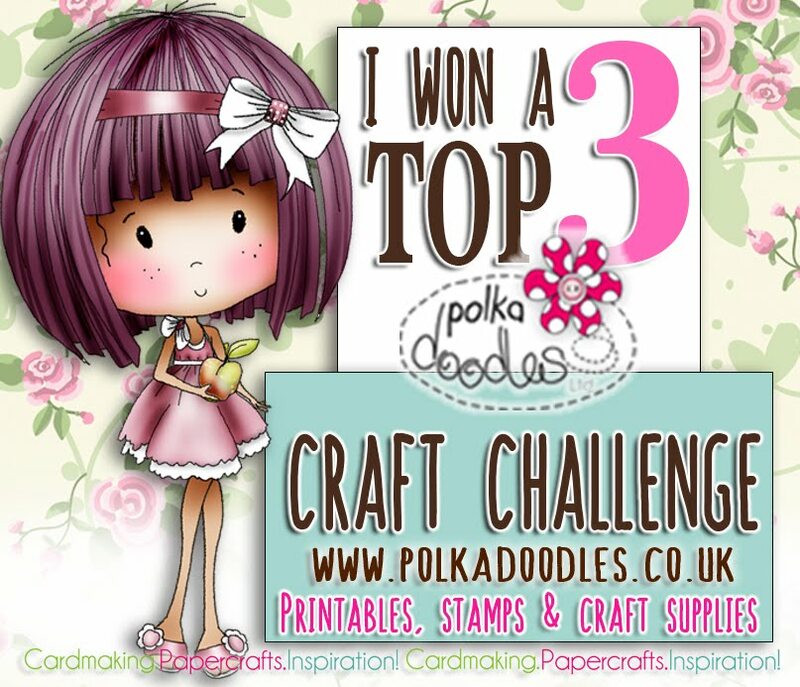 The first placed winner from this challenge will receive a £50 Goodie Bag and the second and third placed winners will each receive a Studio 12 Picknix Collection 1 CD! Please don't forget to follow our rules which are below as we wouldn't want you to miss out, especially with these fabulous prizes on offer! Second Place: Debbie Johns - you win a free download and please use the above verification code to claim. Third Place: littlebee Sue - you also win a free download and please use the above verification code to claim. Congratulations to you all! Please email Nikky to claim your prize and all the blinkies can be found in the sidebar. Please remember to add the verification code and the challenge week in the subject field on your email - you must use the code given above to claim your prize otherwise we cannot release it. Good luck with the challenge - the deadline for entries is Sunday 23 December at 12noon GMT. Kimberly - Hi there, I've made this card for a young niece of mine. She just loves birds and the outdoors. Super simple card to create. I used image from Candy Doodles COLLECTORS EDITION and papers from the Picknix Collection 1 and Picknix Collection 2, they just went so well together. Added a sentiment from Candy Doodles Collectors Edition and some elements from Picknix Collection 1 and there you have it...super sweet. Karon - I made this for a friend who is having a birthday this month. 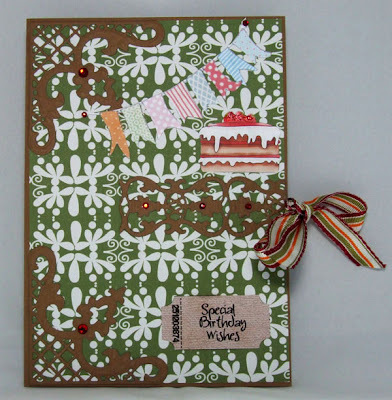 I used the papers from the Studio 12 CD - Picknix Collection2 Gingerbread Twist . The sentiment "Like a snowflake..." is also from this CD, which I merged into some of the backing paper using Word. The main papers are backed with some from my stash. I inked all the edges of the layers and popped up the main sentiment on some foam tape. Added some tulle fabric and a snowflake to finish off. Karen - I don't know anyone with a birthday around Christmas time, so I made a card suitable for a young adult. The image and BP are from the Sugar Plum Daisy CD. (the sentiment is computer generated). Asha - I made this card for a good friend whose birthday is on the 23rd and who, like me, has a sweet tooth. 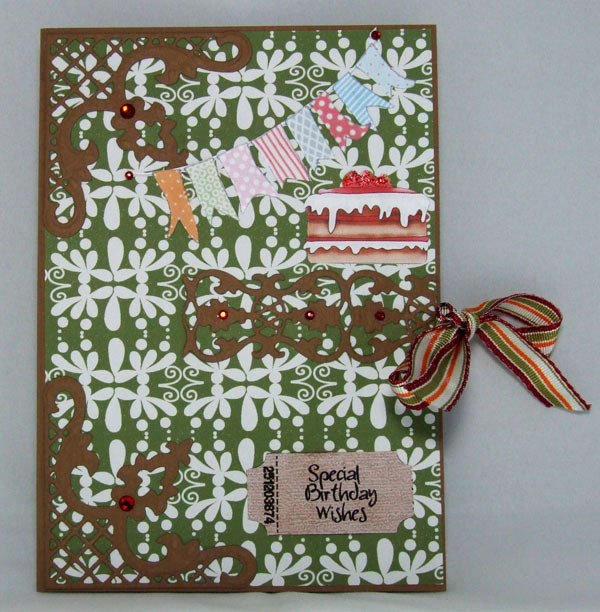 What better excuse to use the pre-coloured gingerbread man image and patterned paper from the PickNix Gingerbread Twist CD. I did not go out of my way to ignore all things Christmassy simply because she is a huge fan the season. Lace, twine and brads are from my stash. Sundae of Seasons. Also on this CD the cake and the banners. In the corners I used the dies from Joy Craft and also on the middle of the card. The ribbon comes from my own collection. A few pearls in Christmas colour and the card is done. background, cut out a frame using Spellbinders label in black cardstock then matted the frame on a dotty background paper and matted that on black cardstock. Miria I made a quick and easy tag for a winter birthday; I used some recycled corrugated cardboard I dabbed with white acrylic. 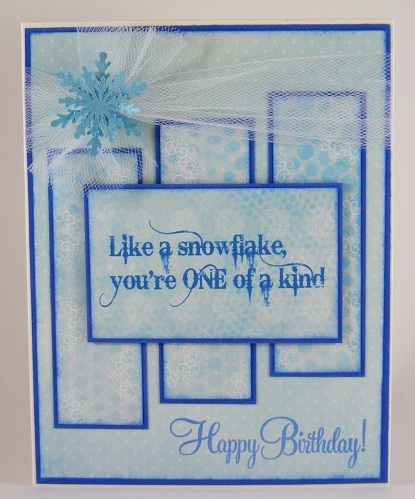 The image and sentiment are from cd Magical Winter 2, I just added some embossing, pearls, button, pompom and a clip. 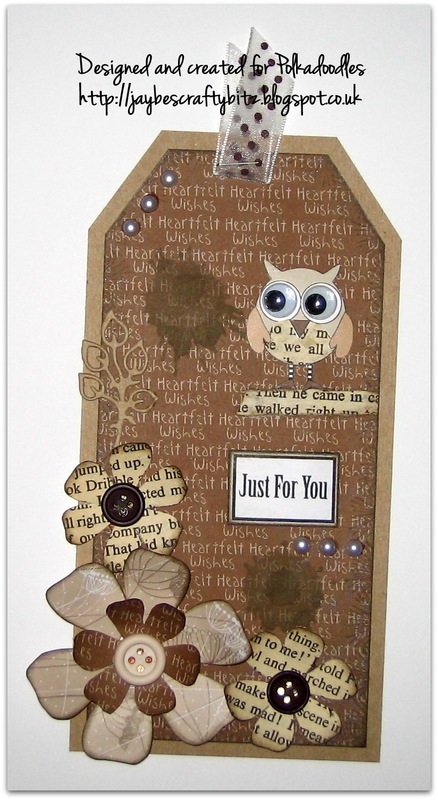 Alethea: I made a card for a young adult using the Hoot Download Bundle. I didn't make it for anyone in particular when I first started it but as it came together I thought I'd give it to my friend who is my age but I'd like to think we are still young adults!! :) . So the Owl, the sentiment banner, the striped banner and the flowers arre all from the Hoot Download Bundle. 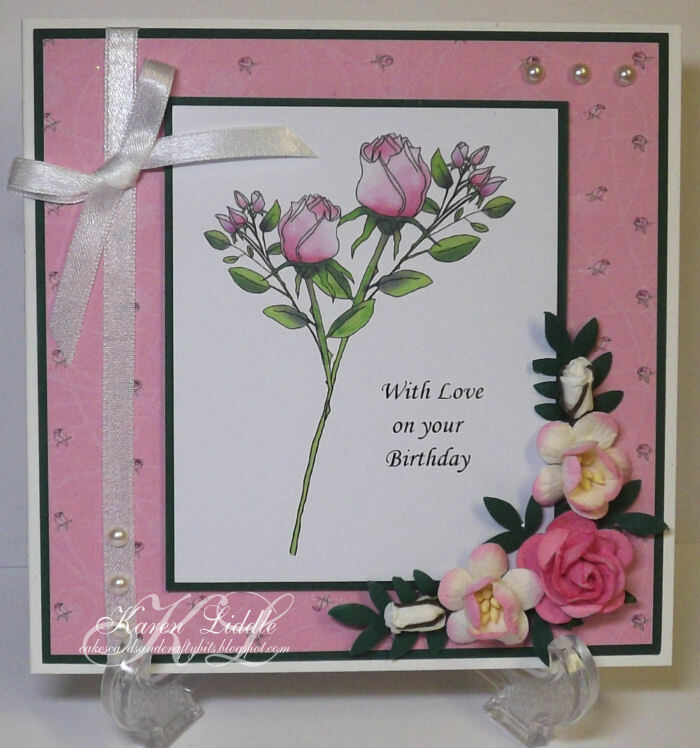 I then just added the rhinestones and buttons and to finish off the card added some sparkle. Fliss: My card this week is for one of my nieces as her birthday is on New Year's Eve and she loves quilting so I decided on a sewing theme using elements and papers from the Sundae of Seasons CD. I die cut the sewing machine topper and sentiment and made a collage style creation which I know she'll like as she's very artistic. Fabulous inspiration I'm sure you'll agree and you have until 12 noon on Sunday 23 December to enter and not miss out on those fantastic prizes. Good luck! 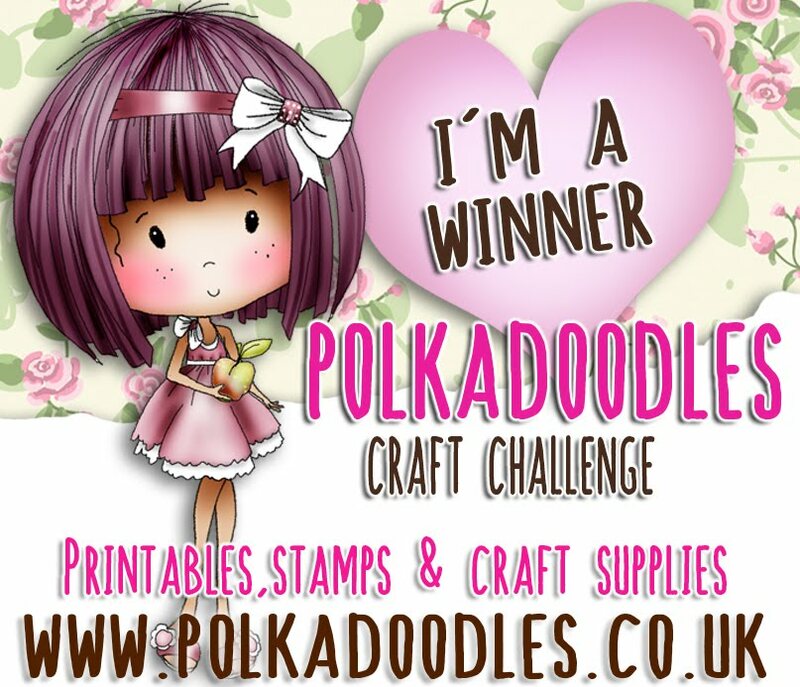 Welcome to a new Polkadoodle challenge! All the Design Team are busy making samples for Nikky's forthcoming Create and Craft Show on tv on 14 December. We all love the designs and once again Nikky has pulled a cracker out of the bag! I really can't say any more but you'll LOVE it!!! So don't forget to tune in at 10am and 4pm next Friday - 14 December - you MUST set your tv to record! It's an unmissable show! Also, the team wanted to let you all know that the brand new Digistore is now open so if you haven't check it out yet make sure you do! 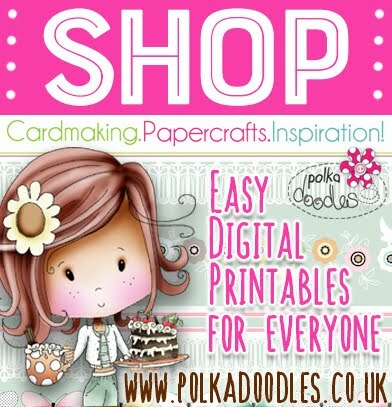 There have always been downloads in the Polkadoodles shop (old store is here) but there is now a dedicated application where your downloads are now released to you IMMEDIATELY - no more waiting for your orders to be dispatched! Nikky and team are now constantly uploading new bundles of stunning paper collections, digistamps, embellies, flowers, borders, ribbons - the list is endless and is constantly growing!! A lot of this content is from existing CD collections so if you're not sure if you want to purchase the whole CD, this is a great way to have a taster! (each product will state which CD it comes from). There are also some new elements in the mixes too so there is still new content along with brand new papers and elements bundles - and they are all being remastered into PNG format (papers are JPG) so you can now manipulate these digi elements as you wish in your own graphics software. 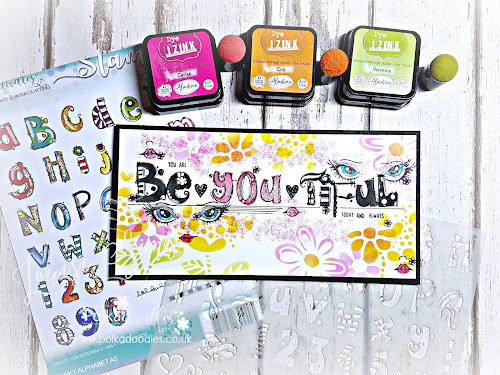 Also check out the brand new Easy Peasies...a collection of pre-designed cards which are ready done for you - just print them out and glue them to the front of a card blank then embellish to get some hybrid crafting going on - EASY PEASY!! These have been mega popular in the shop the last couple of weeks so make sure you check them out. 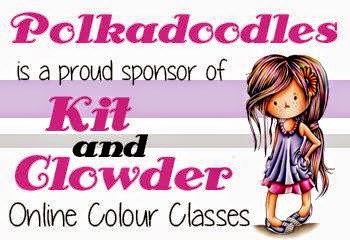 As new CD Collections are released they will also be added to the shop whether Polkadoodles or Studio 12 collections, so make sure you check back regularly to get a little Digi Sugar!! Before we move onto this weeks challenge, I need to announce the winner from Week 47 which was 'Any Die Will Do'. We had some wonderful entries but some had not followed our maximum number of challenges rule so they can't be counted as part of the top three. The lucky winner of the Colour Therapy DVD is Norma! Congratulations!! Please email Nikky with your postal details. Please remember to add the verification code and the challenge week in the subject field on your email - you must use the code (PD1W4947) to claim your prize otherwise we cannot release it. Our second and third placed entries are: Mixamatosties and Anna. Congratulations! Please grab your blinkies from the sidebar. The first placed winner will receive a copy of the Colour Therapy DVD! Good luck with the challenge - deadline for entries is Sunday 16 December at 12noon GMT. Ruth: I've used all paper based elements from Studio 12 Vol 1 Picknix collection - the only added bits are the half pearls and the 'newspaper' which is actually from a 1935 car magazine! I've paper pieced the main image and then inked it before raising it and the tape measure with silicone glue. I've added a faux stitch around the edge of the card and its finished! Lucy ~ I have never done anything like paper Piecing before, so I kept it simple for my first attempt! 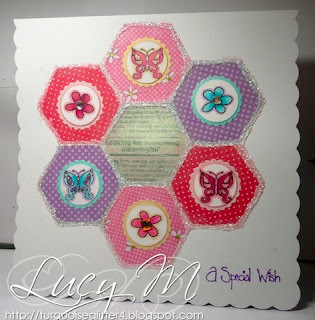 I used my mums patchwork stencils to cut out the shapes from the papers. The papers are from the Pretty Sweet CD Rom. The stamps are from the Flutterfly fairies. Anjie For this weeks card I have used an image and papers from the Pen and Paper Circle Club issue 4. The clothes, shoes, hairband, table cloth and bowl on the image are done by stamping the image onto the different papers and then cut out and stuck onto the image stamped onto white card. The skin and hair are coloured with ProMarkers. I've added an embossed dotty panel to match the dotty papers. The doily behind the image is done using the Marianne D designer doily die and the flowers are from the Marianne D die LR0162. I've done some faux stitching around the edge and added a ribbon bow. JAN: I made a Tag this week for my DT project and decided to use up some scraps of paper that were left over from other projects. The little owl is printed from the Sugar Birdies CD and I have paper-pieced his tummy with some newspaper and added two funky googly eyes. The sentiment is from the Candy Doodles CD, along with the flowers - I cut the large one from pieces of leftover papers and the two smaller ones from newspaper, adding little co-ordinating button centres. A couple of ink splats, a bit of polkadot ribbon and some pearl accents to finish. Eva - I have decorated lollipop for this challenge. 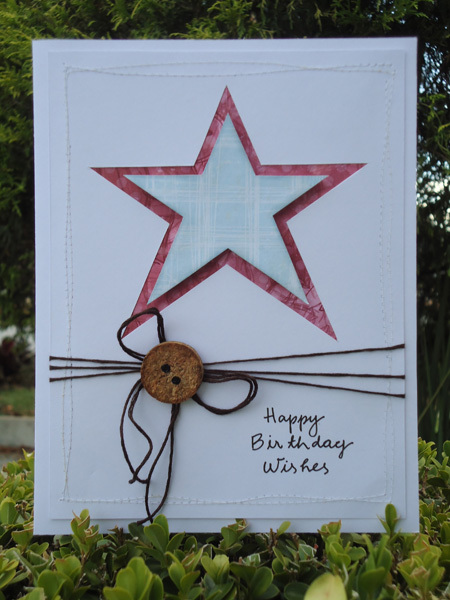 I used Crafts Too dies, a Stampin Up punch and added some stick on jewels, glittery card stock and ribbon. 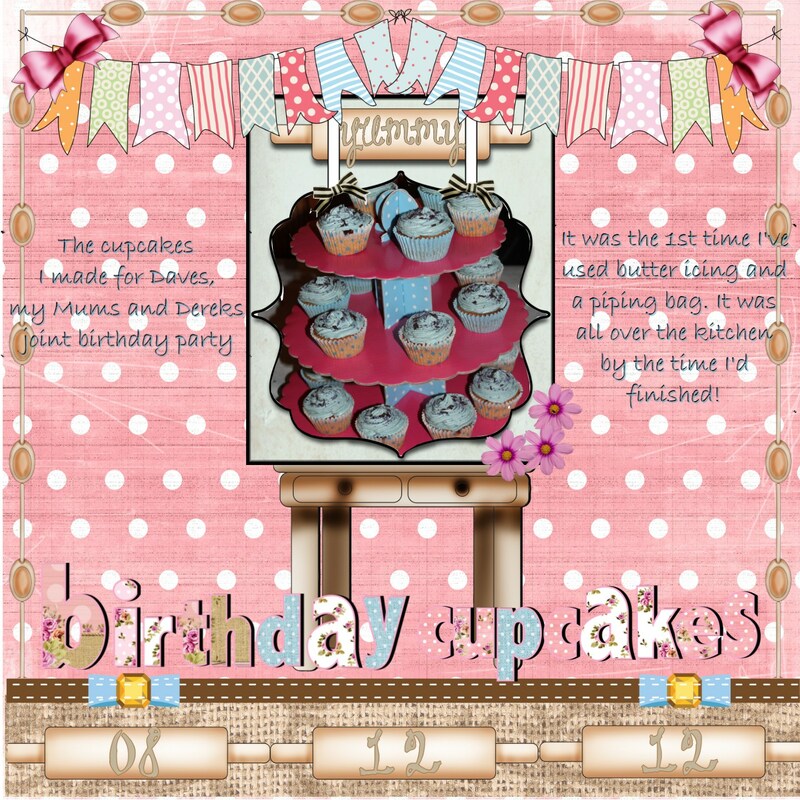 The cute cupcake image, the polka dot paper and the little stars (cut them out from the cupcake image but in larger format) are from the Paper Boutique 3 CD. Clare - For my card I have used the gorgeous Fairy Flutterfly, Meeshelle stamp set and I have paper pieced her, the stunning butterflies and flowers with papers and the sentiment from the very girly Pretty Sweet CD. I have embellished my card with vanilla Doodle Dew Drops and Diamond Stickles. Good luck with the challenge and please remember our rules - deadline for entries is Sunday 16 December at 12noon GMT.